Art, in all its forms, is the Universe expressing itself through human experience and discipline. The Florida A&M University Sustainability Institute invites the entire campus community to submit an original piece of art for the “Art of Sustainability” Competition. Your innovative ideas are solicited to develop artistic expressions about environmental, social and economic sustainability. The creative choice of different two-dimensional media or recycled materials to create three-dimensional works of art will visually express the importance and interdisciplinary nature of sustainability. The competition will recognize student winners with gift awards and campus-wide exhibitions to showcase the completed entries. This creative challenge is also open to faculty and staff and the broader community, whose work will also be exhibited, though not included in the competition. 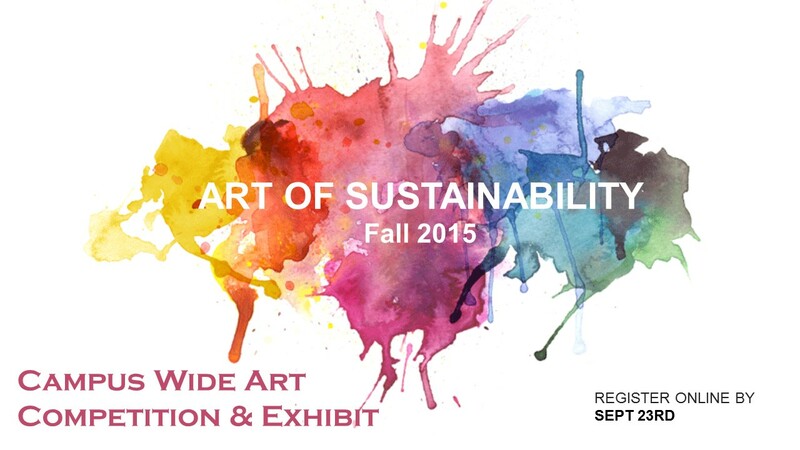 The “Art of Sustainability” initiative recognizes and celebrates the interdisciplinary nature of re-imagining and achieving ecological balance using art to disrupt silos. Led by an Artist in Residence, the initiative will bring the campus community together to co-create a special campus art project bridging art and science. This year, Artist in Residence Kabuya P. Bowens-Saffo, founder of CAP: Collaborative ARTS Projects, designs the campus-wide art competition and exhibitions as a preliminary “Think-Tank” experience to develop mural concepts for the newly established FAMU Recycling Center. The mural will be unveiled during Earth Week in April 2016. The 2-D works of art are drawings, paintings, computer graphic designs, photographs, collages and any works on paper, canvas or wood board materials. This year’s 2-D themes are Change and Resilience. All 2-D works of art must be a minimum of 18”x24” and framed for the final presentation. Contestants are encouraged to research the suggestions of different artists listed and study the images of art examples for ideas to represent the themes. For example, create an image to celebrate human values, inspire new perspectives for climate Change & climate Justice. What questions do we need to ask? For example how can we build more resilient communities, food & energy supply? Draw inspiration from global or local current events. To further demonstrate the artists’ ingenuity with these products, no painting or covering the true identity of the recycled material is allowed. Instead, select choice materials and utilize the original color, labels, product information and text, even damages to the material to inform the creation. Artists can use glue, string, staples, sewing techniques etc. to hold things together or to build creative shapes and forms. Mobile (i.e. moving robots) and or functional installations (i.e. a working lamp) are welcomed. 3-D submissions may be 18 X 24 scale range or larger diameter and should be free standing or able to hang from a ceiling. It is expected that the trash party masks and fashion swag designs can be worn. Submit Short Entry Application: September 1- 25th APPLY HERE!